Democrats caution Republicans on repealing Wisconsin’s prevailing wage. A report from Wisconsin Contractor Coalition claims there’s been a 53 percent increase in new municipal projects being awarded to out-of-state companies. 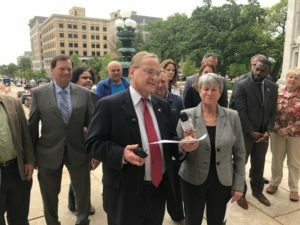 Assembly minority leader Peter Barca spoke against a backdrop of road construction on the Capitol Square in Madison.